I'm so terrible when it comes to shop gifts! I haven't done any shopping for christmas! terrible terrible! But I woulddefinetly buy some of these things for the girls in the family, nice tips zoe! Me quedo con la colonia Chloe, me vendria genial que ya se me esta acabando!jejej!Un besiiiiiiiin! Aw wow Zoe, we are spoilt for choice here, these are some fantastic picks. I wouldn't mind having those emerald earrings, number 14, 15, 20 and 24.
great gift ideas. Love it. thanks for sharing. I will totally love the watch and bag! I love the candles! Great idea! 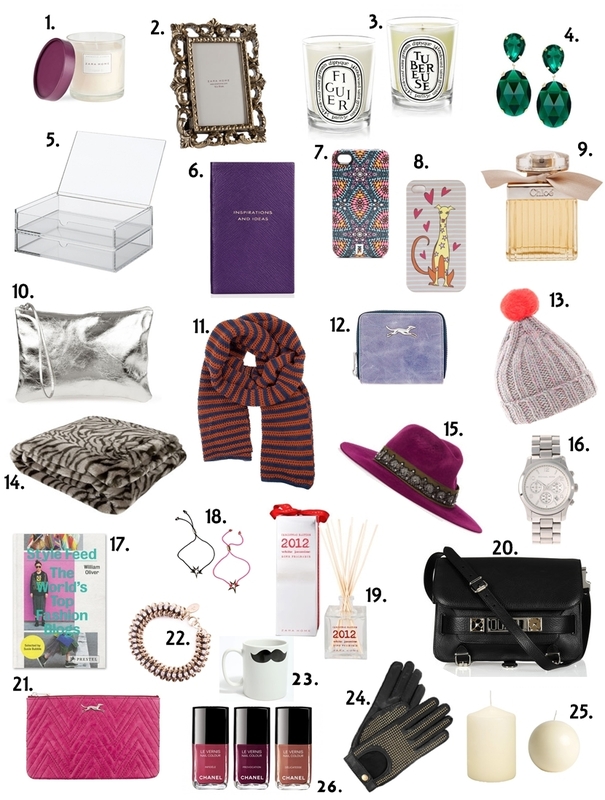 Great post, I agree every item you've picked would be an awesome present! I'd love to find this blogs book and nailpolishes under my tree! hola corazon!siento haber tardado en pasar por tu blog, pero es que no paro!son unas ideas geniales!me encanta pasar por tu blog!=) un besito enorme! Son unas ideas geniales. Me quedaría con algún detallito de Bimba & Lola, algún pintauñas o velas. Un post muy útil! I really love all of these ideas, specially that gorgeous Proenza Schouler bag!! ui que de ideas me has dado zoe!